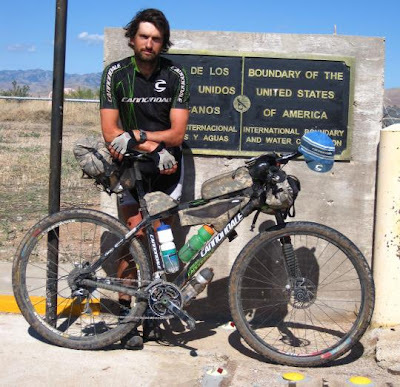 At 9:45am (Mountain Time) this morning, Matthew Lee became the first to reach the Mexican border and victory in the Tour Divide, finishing with a time of 17 days, 23 hours, and 45 minutes. The Tour Divide is a race along the Great Divide Mountain Bike Route, which stretches 2,493 miles from Banff, Alberta to Antelope Wells, New Mexico. This was Matthew's 6th time finishing the race, 4th time winning, and 2nd consecutive win. Read more details at the official Tour Divide web site. Whether you follow bicycle racing or not, you gotta appreciate that that's some serious riding.